LaLime's is considered one of Berkeley's better up-scale restaurants featuring Mediterranean-inspired California fare. Like many Berkeley establishments, LaLime's uses mostly organic produce. We'd attempted to have a family dinner at LaLime's last winter but were thwarted at the last minute by a random power outage at the restaurant. So when my mom-in-law was in town for a visit a week or so ago, we all piled in the car for a second try. 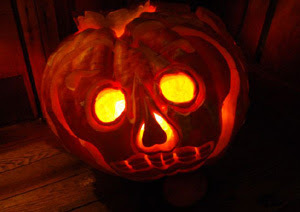 A huge carved pumpkin greeted us outside the door (it was a day or two after Halloween). Inside, was a mix of round and smaller square tables and a pleasantly pitched din of clanking forks and conversation. School house lights cast a low, warm light. In a nutshell, the ambience was pleasant, if a little stuffier than I'd prefer, and the food was very good, if more expensive than I'd normally go for. 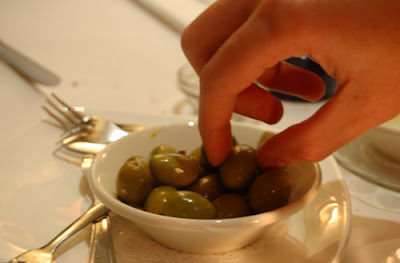 We started with an appetizer of Lucques olives with orange zest, anise, and thyme. These little green olives were citrusy, herby, and delicious. Grilled Berkshire Pork Chop with Apple-Pear Chutney and Mashed Potatoes ($25) The pork chop was really good (I was very happy with my order.) The mashed potatoes were rich and interesting, the chutney was a perfect complement - sweet and spiced, and the braised greens were also done to perfection. 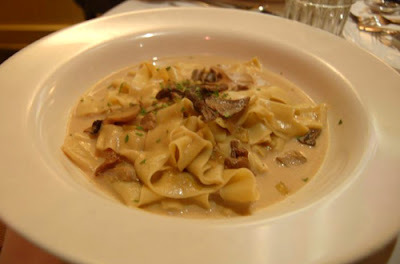 Wild Mushroom Stroganoff with Brocolli Rabe ($19) The stroganoff was also excellent - buttery noodles with a light cream sauce of woodsy, wild mushrooms. My sister-in-law felt that the amount of garlic on the broccoli rabe was a little excessive though the rabe itself was good. Marmitako: Basque Seafood Strew with Tuna, Prawns, Sweet Peppers and Tomato ($26) I did not taste the Basque seafood stew (too fishy for me) though I did notice that it all got eaten. It was probably the most impressive looking dish we ordered, though. 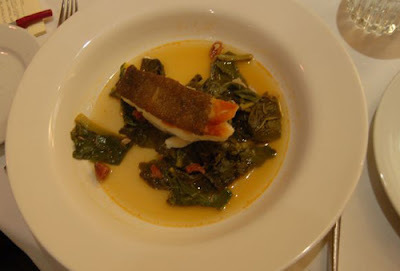 Atlantic Cod with Braised Chard and Spanish Chorizo ($25) The cod was extremely tender and the spicy chorizo was a nice complement. 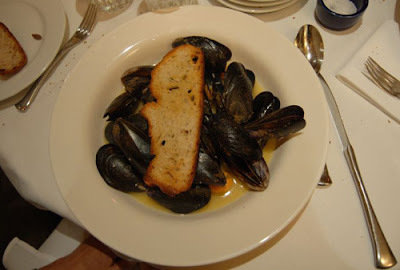 Mussels Steamed with Pernod, Garlic and Lemon ($12) I also did not taste the mussels but my mom-in-law reported that the sauce was excellent - lemon, butter, mustard and wine. Baked Poblano Chile Stuffed With Zucchini, Wild Mushrooms and Fromage Blanc ($9.50) (Sadly, I forgot to take a picture of this) I tend to stear clear of the spicy foods but my mom-in-law informed me that it was delicious. However, none of us liked our waiter, a young man who seemed to lack warmth and social graces. He lost us early on in the process when he told us, "I just want you to know that if you're not ordering appetizers, it's going to be a 30-minute wait." This struck us all as a kind of thinly veiled threat which was not actually offered out of concern for our comfort but, rather, to push us into ordering more food, thereby ensuring a bigger gratuity for himself. The busboy who de-crumbed our table managed to thoroughly crumb us all, instead. Any crumbs he did not brush directly on to our bodies went straight on the floor. But we never lacked for food, water, or silverware, so I would not call the service bad, just not great. Monday-Thursday 5:30 - 9:30 p.m.
Friday-Saturday 5:30 - 10:00 p.m. I am disappointed to hear of your service experience at Lalime's. 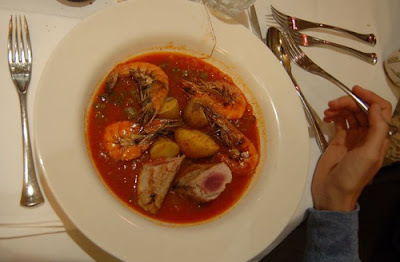 It is one of our favorite restaurants and we have gone there periodically over the years. 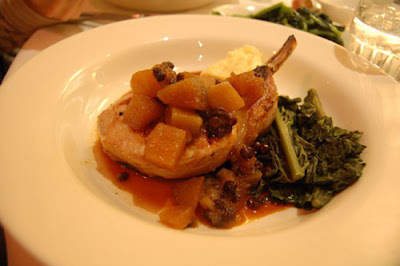 For years, it was considered "Chez Panisse Light" as it did a single menu (the way the Chez Panisse downstairs does). It is only in the last few years that it has done the a la carte style (it may have even been 5+ years ago, but with a place that has been open as long as it has, it still seems like a recent change). There is really no excuse for poor service at any restaurant and it can really harm the meal at a high-end restaurant (the saving grace is when you are with a fun group; I don't know that excellent food alone can save bad service when the prices are so high; there must be more intangibles). For your non-Berkeley readers, it might be interesting to note that Lalime's is the anchor to Berkeley's premier restauranting family, the Krikorians. Fonda Solana (tapas), Jimmy Bean's (very casual bistro, great breakfast), Sea Salt (seafood) and T-Rex (bbq) round it out. We go to all of them (including taking the kids to T-Rex and Jimmy Bean's). However, to my knowledge, Lalime's started it all (opening in 1985). Normally, I would suggest that you go back and if the service still lags behind the food, to bring it up to the manager (though not that night because the manager on duty will get defensive and the scene will be confrontational). However, the problem is, again with expensive dining, that one generally can't afford to give it another try (with so many great places, it is not really necessary). That said, I would encourage you to contact the manager about this recent experience. He/she should know about it. Sea Salt and T-Rex are definitely on my list of restaurants to try! and Rahm loves Jimmy Bean's - it's very close to his office so he gets lunch there sometimes. You may be right that most of the service staff is likely great (I can't recall any bad service experiences), however, you seem to have been stuck with two. One may have been inexperienced or rushed and the other seemed pretty rude or unclear on the concept of good service (or, even worse, greedy). Whatever the reason, a place like Lalime's should continue to hold itself to a high standard and its customers should not have to suffer for even, at best, a bad night for a server. We are all entitled to those (bad days or bad nights) but, in a service industry, when that happens the customer should not bear the burden. That is why I think you should contact the restaurant. They should know what your experience was (and, who knows, maybe they'll come back with a gesture to bring you back sooner rather than later (like, "well, we are really disappointed to hear this. I am sure a totally comp'd dinner for 4 is in order. The one condition is that you have to bring your neighbors to south. ").